I should start by saying I would not teach as I know I cannot teach. A teacher is a very special person who loves to share to what they can do and enthuse a whole new generations of people/children,like my friend and tutor, Beryl Kerwick. She is a an amazing teacher and truly inspiring. She was not teaching this class, don’t think she teaches now unfortunately. So I attended the above class over the weekend and it was described as a short course for beginners and for people who want to refresh their skills. It was disappointing but then I should have expected that when the word ‘beginner’ is used in the description. 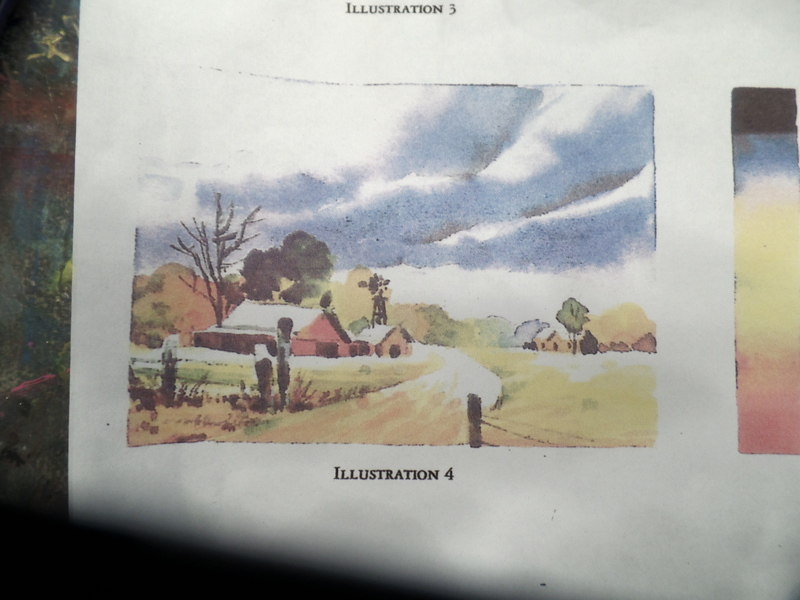 It was a good class for people who had absolutely no knowledge about watercolour. The tutor was fine but not that inspiring. She very softly spoken which was meant she was barely heard over the rampant air conditioning the art school has installed. Every time it came on, there was very large BANG, as what appeared to be an inflatable tube was filled with rushing air. 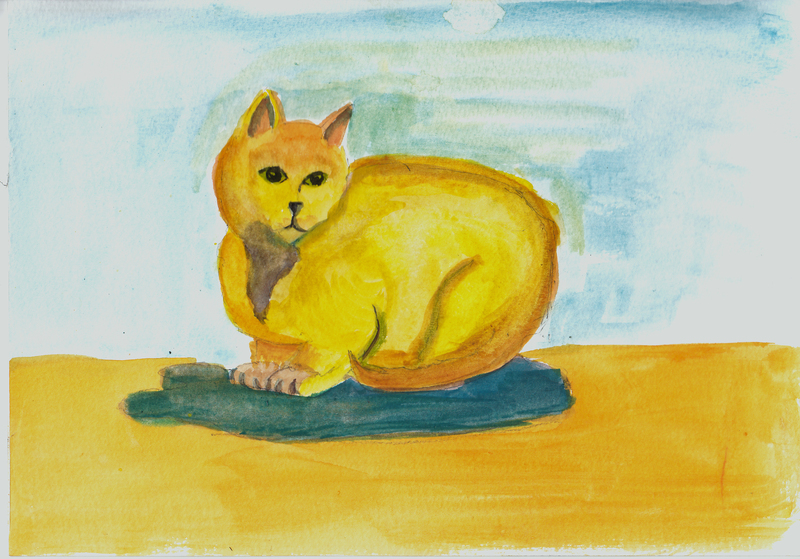 We began by doing a colour wheel and then copying a drawing of a cat, the tutor provided. She then demonstrated how to paint in the cat. Here is my very poor imitation. I decided to add vague background and some sort of ground for it to sit on. 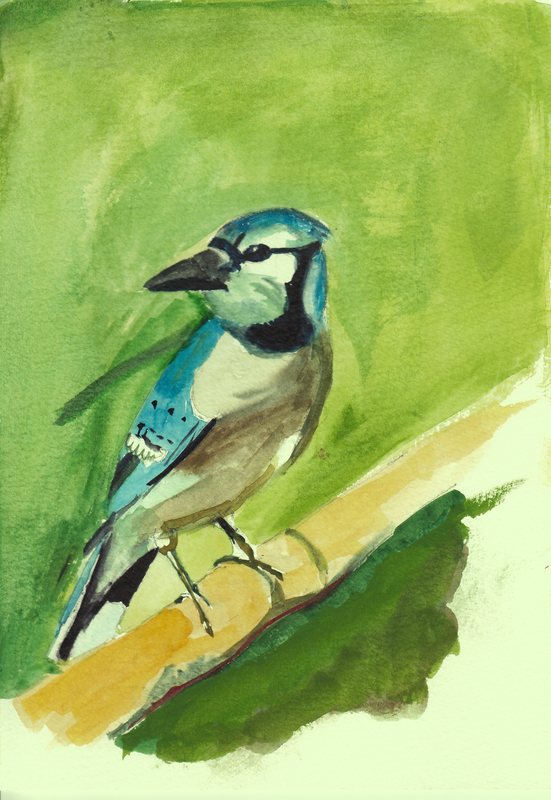 I have never attempted a bird in my life but that would be poor excuse for my feeble attempt. I wish I had taken out the paper from the plastic pouch as the light glaring onto it was hurting my eyes. Again she did a small demonstration of how to do the background. My poor attempt. Finally she provided 3 little still life set-ups with fake flowers (well the one before me had fake flowers). With this exercise, I had no excuse as we were left completely to own devices for this exercise as by this time, she had given up demonstrating and was going around giving advice to the group as they painted or working on a painting of her own. my still life setup. I was the only one at this table. I was too close to the set up, so I was going a little cross eyed doing this but that is no excuse for poor painting. However, it was the one I enjoyed doing the most as I wasn’t restricted to copying another image. 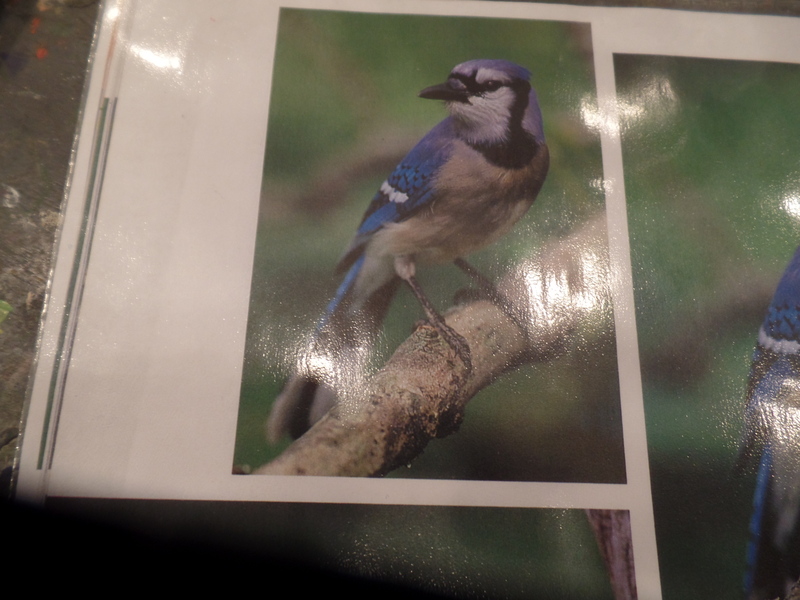 I suppose I could have gone mad with the bird but she seemed quite insistent on getting the blue, black and white definitions correctly. With the still life we were giving free rein. I was actually looking down on the arrangement so the red board in the background seemed to be above the flowers There are bits I like about it, so I wasn’t too unhappy when I left for the day. Like the day before I was late to the class as I missed a turn on my journey there which resulted in a big detour and then the car park at the school was full (parking is always terrible as there is so little of it). Anyway by the time I came in, the tutor had handed out a sheet with the outline of leaf and we were to practise wet on wet painting. 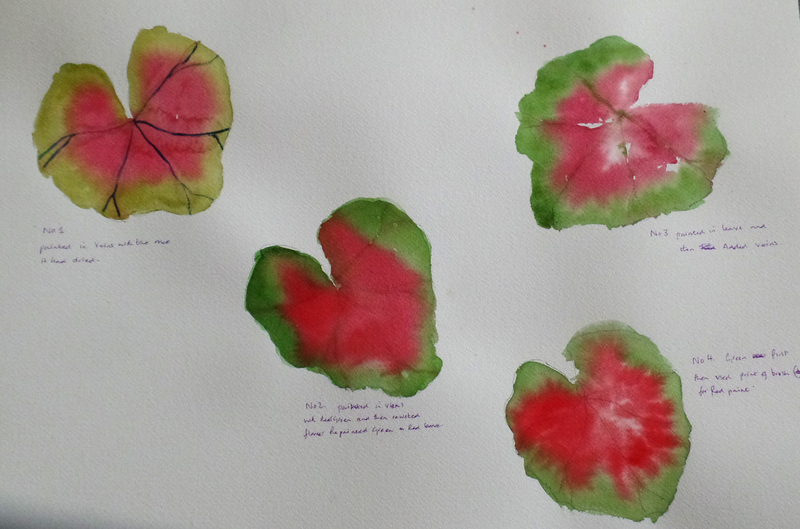 This was pleasant little exercise and I tried out 4 different leaves on the expensive Arches cold press 300 lb watercolour 14in x 20 in(36cm x 51 cm) block she had recommended we use for this class. The day before I used Cotman’s gummed water colour pad 140lbs 10 x 7 inches (25.4 x17.8 cm) which I had bought to sketch with but brought to the class just in case. 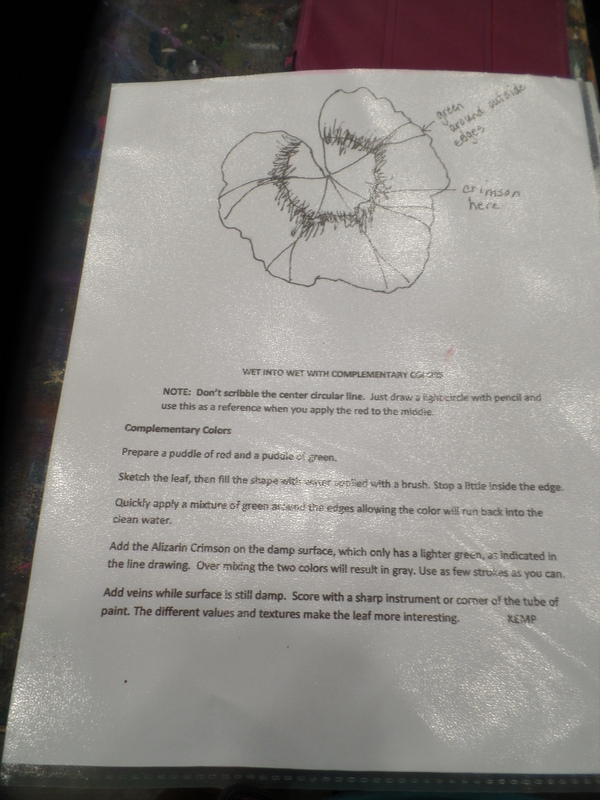 The last exercise was again provided by a worksheet , either a landscape from an instructional book or a really bad photo of a bay in Mexico. 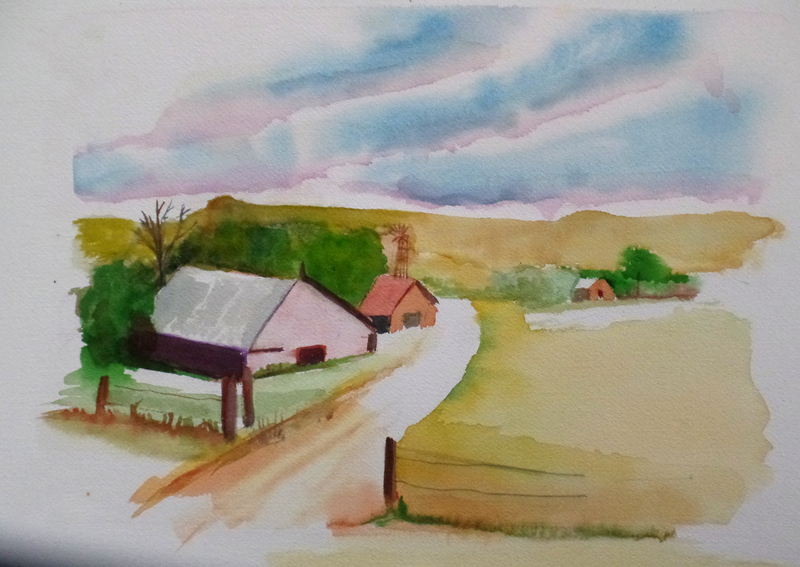 I chose the instructional landscape as I was going to use the larger format paper and a poor photo which measure about 2 x 3 inches wouldn’t have worked. Maybe if I had some link to the image I could mange it as I have worked from 4 x 6 photos of landscapes I have taken before, where memories have managed to fill in the gaps. 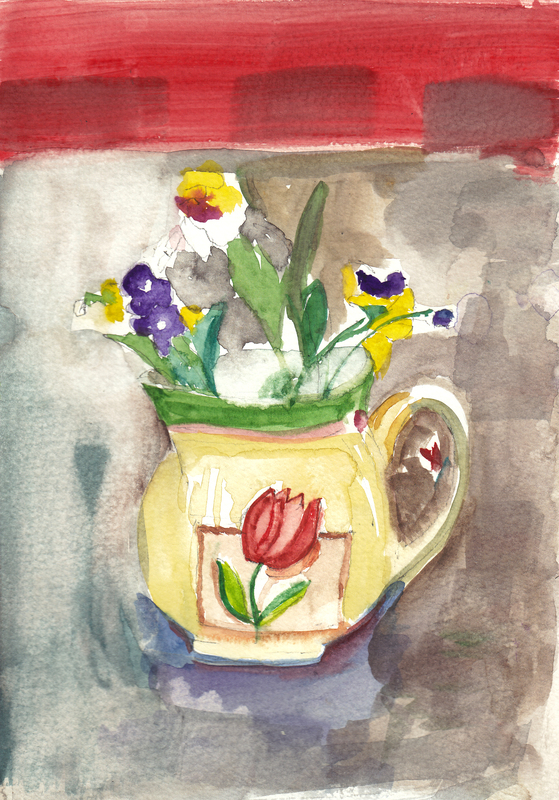 So basically the class was a dud, I am not even sure that a beginner watercolourist would have gain much from it but it definitely shouldn’t be advertise for anyone other than beginners. 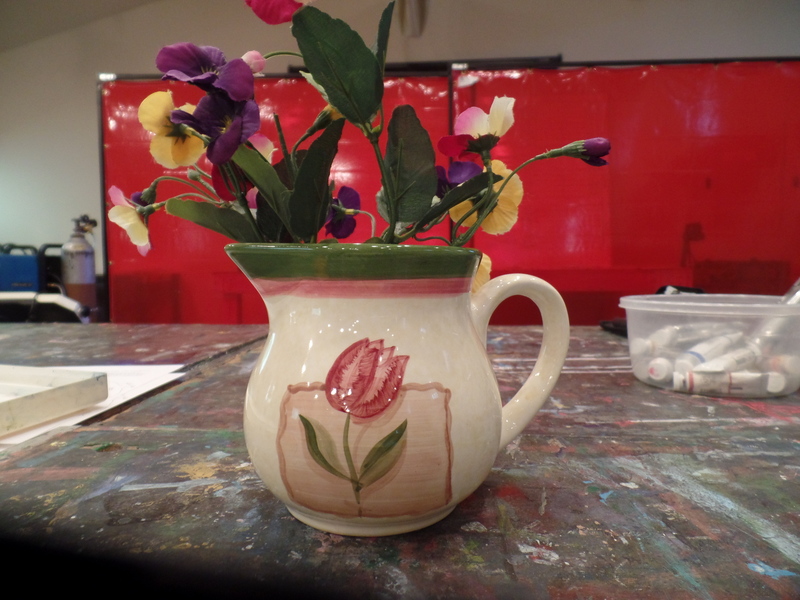 However, it was great to be just painting again with a group and that is probably why I subject myself every so often to these classes but I must stop. This entry was posted in Uncategorized and tagged laguna gloria The Comtemporary Art school austin., watercolour class.. Bookmark the permalink. Jacqui, I know how frustrating it can be being taught by not very good teachers especially since you have been taught by some very famous ones. And it must be even more galling having to work from very small reference material but I can see your work is developing in spite of all these frustrations. Believe me all that slaving away outside is bearing fruit.